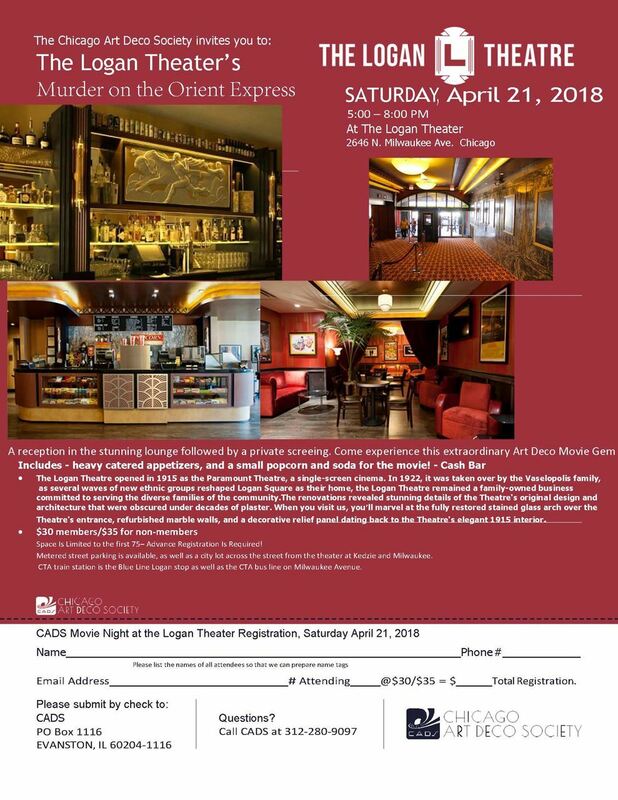 Join CADS at the Logan Theatre for a reception in the stunning lounge followed by a private screeing. Come experience this extraordinary Art Deco Movie Gem. The Logan Theatre opened in 1915 as the Paramount Theatre, a single-screen cinema. In 1922, it was taken over by the Vaselopolis family,as several waves of new ethnic groups reshaped Logan Square as their home, the Logan Theatre remained a family-owned business committed to serving the diverse families of the community.The renovations revealed stunning details of the Theatre's original design and architecture that were obscured under decades of plaster. When you visit us, you’ll marvel at the fully restored stained glass arch over the Theatre's entrance, refurbished marble walls, and a decorative relief panel dating back to the Theatre's elegant 1915 interior. Space Is Limited to the first 75– Advance Registration Is Required! Metered street parking is available, as well as a city lot across the street from the theater at Kedzie and Milwaukee. CTA train station is the Blue Line Logan stop as well as the CTA bus line on Milwaukee Avenue.